With 25 years of experience building affordable housing, its no surprise that New Frontier Tiny Homes managed to pack some serious luxury into a 240-square-foot mobile home. 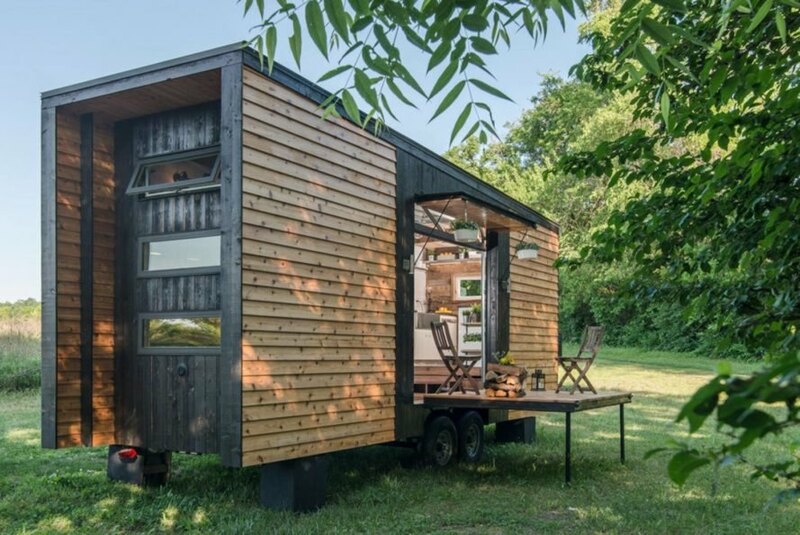 The new Alpha Tiny House, which comes clad in a gorgeous charred wood skin, features charming vintage interiors, transformable furniture, a loft, huge windows and a fold-down patio. Stunning both inside and out, this home not only moves anywhere, but provides plenty of comfort and space no matter where you end up. 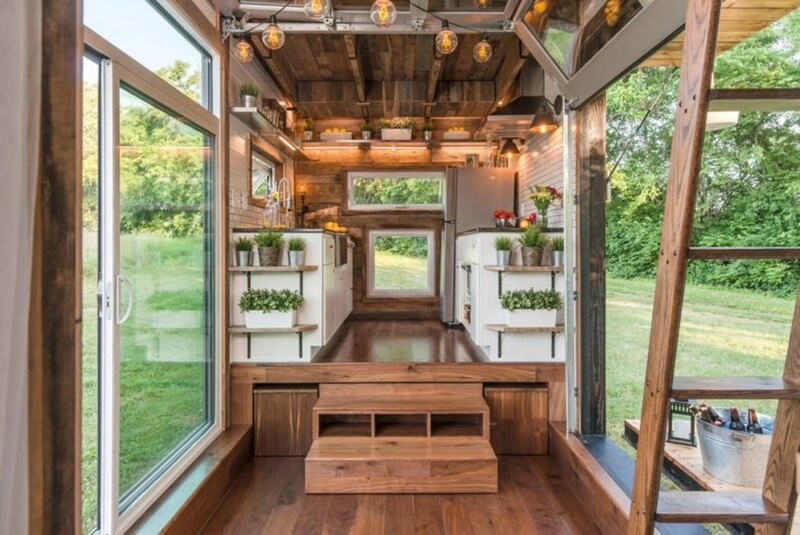 New Frontier Tiny Homes is owned and operated by David Latimer, Zac Thomas, and Eddie Latimer, who seek to develop tiny houses on wheels for people to live in a more sensible way. They hope to show people that they can live economically, socially and environmentally-friendly without compromising on aesthetics. Their latest creation, the Alpha Tiny House, combines their expert construction skills with a Japanese technique for keeping fire, bacteria and fungi naturally at bay called Shou Sugi Ban. This wood burning technique was applied to leftover cedar wood from a barn, while its cozy interiors make for a lovely contrast inside. The interiors are where this home shines: filled with storage, transformable furniture, vintage and classic design pieces, as well as an eight-person dining table, it is surpisingly large. A hidden loft bedroom also fits in the space, and a complete kitchen with the latest appliances shows living outdoors doesn’t always mean roughing it. The pop-up home is completed by a Jacuzzi tub, a modern shower, and composting toilet for a touch of modern-rustic. New Frontier Tiny Homes is run by David Latimer, Zac Thomas, and Eddie Latimer. Their latest creation, the Alpha Tiny House, combines their expert construction skills with a Japanese technique. Its cozy interiors make a big contrast. It can fit an eight-person dining table. It has a loft with a bed. New Frontier sells their tiny home starting at $95,000 for the base-line features.